despite several attempts. Note that the routes marked on the topo above are approximate. The South Ridge was originally reached from Jagged Stream but can be approached from the Lawrence side via the north arm of the Lawrence Glacier. From here, climb a rock step to reach the glacier draining the north-west side of Lawrence Peak and so the long South Ridge. Once on this narrow, loose and steep ridge, negotiate towers and guts to the summit. Climb the face to join the South Ridge 30 metres east of the summit. The pair made a further two unsuccessful attempts to reach the summit directly. Start up the prominent couloir to the right of the summit. Rockfall forced the party to the right, on to the face, and they gained the south ridge about 100 metres below the summit but didn’t continue to the top. 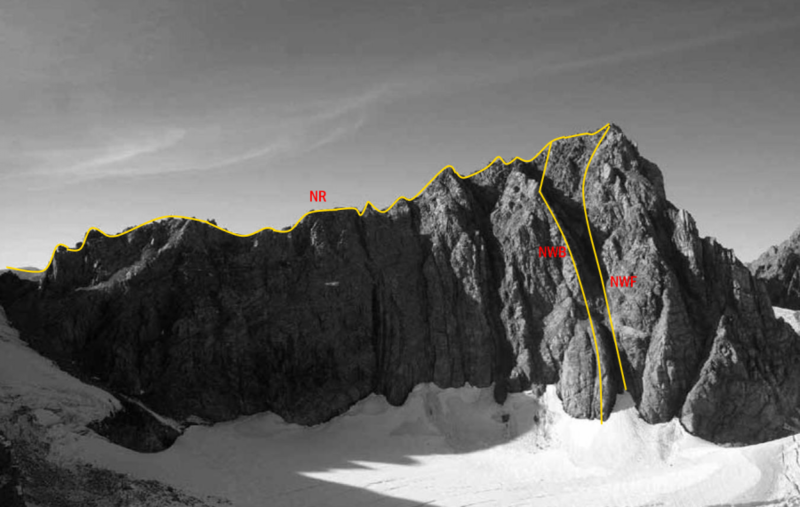 The couloir rises from about the 1800-metre couloir, to the east of North Peak, and leads to the northernmost of the Gridiron Glaciers. Initially keep to rocks on the left, or climb the couloir from the bottom halfway to its head, and then move on to broken and jumbled rock to gain the final rock ridge, which is loose and exposed in places. Beware of falling rock and ice. From Reischek Col the ridge is narrow and loose. Alternatively, cross the Assault Glacier at about half height and traverse snow slopes, climbing to the ridge at about its midpoint. 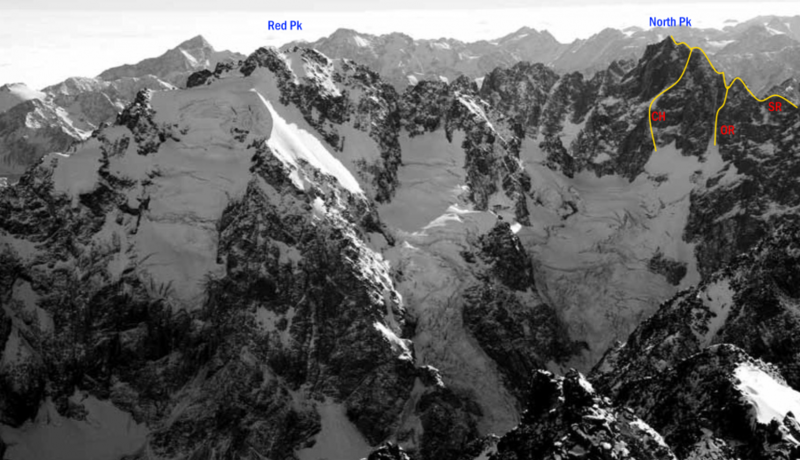 From the head of the Reischek Glacier climb rock to the left of a snow couloir which leads on to the North Ridge. After the first 100 metres or so the climbing gets more difficult and it may be necessary to traverse into the couloir (prone to rock fall). Regain the buttress where possible and climb a large chimney. Once through the chimney, cross the face under the summit to join the North Ridge just below the summit. From the Reischek névé the route starts in an easy gully, followed by rock climbing. Direct but not hard. From Lawrence Col follow the ridge on generally sound rock. The crux is at the end of the first pitch.